TPS lead a team that included WATG, Peridian Singapore and Chao Tse Ann and Partners in a competition for the design and planning of a 350 hectare (868 acre) area in the eastern part of Singapore surrounding Jurong Lake. 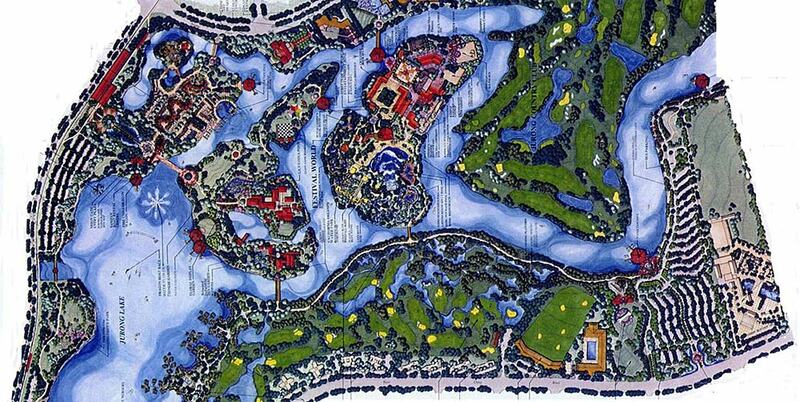 The Conceptual Master Plan provided for an integrated leisure and entertainment zone themed with a dragon, shopping and entertainment areas, themed water village holiday chalets, a public 18-hole, par-3 golf course, additional scientific and cultural facilities including an ecology centre, discovery centre, wetlands park and Chinese art museum. There were also a variety of active and passive park and open spaces. The plan also included the integration of existing cultural and recreation facilities including Jurong Country Club, Japanese Garden and Chinese Garden. A major feature of the plan was an themed entertainment area which included an “angry dragon” themed roller coaster as well as 11,000 square feet of retail, food and beverage and shopping. Another major feature was “Festival World” which was a one-stop themed entertainment area comprised of three main elements; “Boogie Street”, The California Dreamn’ Water Park and Streets of the World. For: Technology Parks Pte. Ltd.